I tend to think of Muscadet as a winter white wine, a wine to drink on a cold January night with a plate of raw oysters. I bet I'm not alone in this - Muscadet and oysters are a classic and wonderful pairing. But the best producers in Muscadet are now making wines that, in my opinion, are versatile enough at the table to transcend the oyster stereotype. Perhaps even the seafood stereotype entirely. It's not just any Muscadet that I'm talking about, though. I'm talking about fine wines by a handful of great producers, like Marc Ollivier of Domaine de la Pépière, Pierre Luneau-Papin, Jo Landron of Domaine de la Louvetrie, Guy Bossard, and André Brégeon. These producers make wines that offer ocean side aromatics and flavors, but also herbal notes, and even, heaven forbid, beautifully expressive fruit. I recently had the opportunity to drink several of these wines over dinnerwith a group of friends. The overall quality level was simply astounding, especially given the fact that none of these wines retails for more than $25. NY Bossard-Thuaud Vin Mousseux, $18, Chartrand Imports. This is Guy Bossard's sparkling wine, made mostly of Melon de Bourgogne (the Muscadet grape), but there is also some Gros-Plant and Cabernet Franc in the blend. There aren't many under $20 sparkling wines that are as good as this one. The nose is leesy at first, and there are fine mineral and lemon zest aromas. The fruit is perky and ripe, there is good acidity, and the finish is clean and brisk. Our bottle of 2007 Domaine de la Pépière Muscadet Clos des Briords was corked, sadly, as was our 2005 Luneau-Papin L D'Or. I've warned people about drinking wine with me, that I am a magnet for corked wine now, but they just don't listen. 2006 Guy Bossard Muscadet de Sèvre et Maine Expression d'Orthogneiss, $19, Kysela Imports. Yes, Bossard's still wines are imported by a different company. 2006 wasn't the greatest vintage in Muscadet, but this is great wine. Shy at first, but the nose opens up to reveal beautiful floral notes. Great purity and freshness, like spring water. good acidity, and an energetic lemongrass finish that makes me think of pairing this wine with Thai style roast chicken or spring rolls. 2007 Domaine de la Louvetrie Muscadet de Sèvre et Maine Sur Lie Le Fief du Breil, $18, Martin Scott Imports. One of my favorites every year, this seems to be a particularly excellent vintage for this wine. 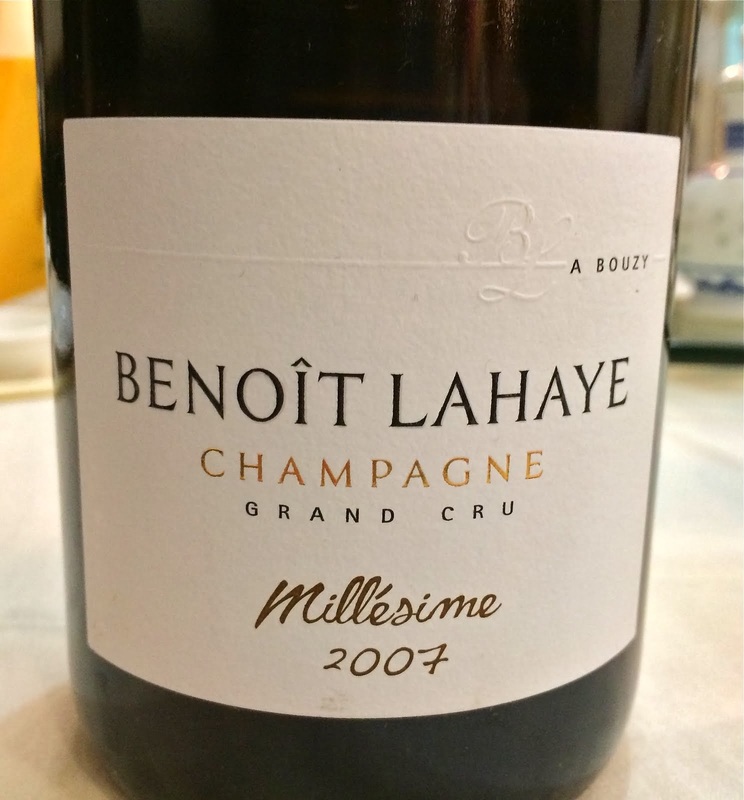 The nose is leesy and rich, and very expressive with anise, herbs, and ripe citrus fruits. The palate is quite closed still, but the raw material is obviously very lovely, with hints of fruit, wet rocks, and ocean water. I'm putting mine away for 10 years minimum, and when I crack the first one it's going to be with a simple roast chicken, and braised fennel. 1997 Luneau-Papin Muscadet de Sèvre et Maine L' D'Or, $23, Louis/Dressner Selections. Recently re-released by Dressner. Next to the above wines the nose here is much more mature, with wild mushrooms in the foreground and the immutable brine and citrus aromas underneath. A truly compelling nose that was at its most expressive a solid hour after opening. The palate was as youthful as the 2005 I had a few months ago. This wine seems as if it could do another 15 years in the cellar without blinking. If I have the good fortune to drink this again, I hope it is served along side a plate of wild mushrooms cooked with nothing other than butter and perhaps some thyme. We then moved on to drink two very special wines, wines that according to David Lillie of Chambers Street Wines, might represent the future of Muscadet. Within the rather large AOC that is Muscadet de Sèvre et Maine, there are certain parcels that offer particularly high quality, parcels that some growers are vinifying separately in order to showcase the specific terroir. These wines are typically aged on the lees for much longer than is allowed under the current rules, and ironically cannot be labeled Sur Lie. In fact, these wines are sometimes not labeled as Muscadet, That's how different they are from Muscadet de Sèvre et Maine, or more aptly, that's how annoyingly absurd the French appellation systems can be. I think of these wines the way I think of Burgundy wine - they are highly site specific. Domaine de la Pépière's Granite de Clisson is an example of this kind of wine - a superb wine last produced in 2005. We did not drink that wine on this night, but we did drink two others that were perhaps equally wonderful. 2002 Luneau-Papin Muscadet de Sèvre et Maine Clos des Noelles Excelsior, $22, Louis/Dressner Selections. I'm going to come right out and say it - I LOVE THIS WINE. From vines at least 60 years old in the village of La Chapelle-Heulin, aged on its lees for three years. The nose is brisk and mineral, but with a nutty depth, and with lovely ripe fruit. I was once poured this wine blind and the first thing I said to my friend was "Well it's obviously a Muscadet." It is the essence of everything Muscadet, but more intense and delicate and deep. Brilliant purity on the palate, great acidity, very youthful, this wine will clearly reward long term cellaring, and somewhere down the line I think will make a great cheese partner. 2000 Michel Brégeon Muscadet de Sèvre et Maine Gorgeois, $22, Fruit of the Vines Imports. From vines in the village of Gorges where there is apparently a special black granite that gives this wine its unique character. We were advised to give this wine a lot of air, so we decanted it for 2 hours prior to drinking. It was absolutely beautiful wine, my favorite of the night. The nose was focused and energetic with detailed notes of licorice and lemongrass, and ripe fruit that had a tropical edge to it. Someone said pineapple. Very intense and rich on the palate, buzzing with energy, many layers of fruit and minerals, and a long finish that ends where it started, with licorice and lemongrass notes. I want to drink this wine with tea smoked duck. Who are you to stop me? Bay Area wine blogger Cory Cartwright is celebrating the 1st anniversary of his blog Saignée by hosting an event that he calls "31 Days of Natural Wine." Cory writes passionately about the wines he loves, and about his life in the Bay Area and beyond. His blog is always interesting to read and his writing style is off-beat and truly hilarious. I am honored and happy that Cory asked me to participate, and this post also appears on Saignée as the Day 8 post in "31 Days of Natural Wine." I'll never forget our visit to Domaine Bernard Baudry in Cravant les Coteaux, right outside of the town of Chinon. It was November of 2005, BrooklynLady and I went to France together for the first time. A day or two in Paris, but most of our time was spent exploring Vouvray, Montlouis, Tours, Saumur, Savennières, and Chinon. Our visit to Baudry began with a bit of an adventure. I drove our tiny jittery rental car from the hotel in Chinon to the estate, but via the bumpiest of unpaved back roads surrounded by forest, passing no one and nothing, unsure of the proper route. We eventually arrived a half hour later, but only after some treacherous driving and several stops to ask directions. Upon arriving we were warmly welcomed by Bernard's son Matthieu who told us that Baudry's house and estate can easily be reached via one of the main roads out of Chinon, perhaps a 10 minute drive. My wife looked at me with what has become a familiar facial expression, a crooked smile that says "You sometimes amuse me in your ineptitude and dorkiness, dear husband." Matthieu showed us cement vats full of fermenting juice - we saw and smelled the glorious 2005's as they bubbled away, turning sugar into alcohol. I climbed a tall wooden ladder and stuck my head in one of the vats. Pungent, and also not easy to breathe - not a lot of oxygen. Everything was immaculate, even the antique tools hanging from the wall. We saw the vineyards surrounding the house, and then joined Matthieu in the house's tasting room where we sampled everything from the most recent Croix Boisée Blanc to the new lineup of reds to a 1996 Les Grezeaux, a gorgeous wine. Matthieu Baudry is in his mid thirties, married with two kids, properly schooled and internationally experienced in wine making, and now working with his father at the family estate. He is an absolutely lovely person, so warm and friendly, and genuinely interested in sharing his wines. I've had the pleasure of meeting him several times since that visit, at tastings in New York, and he continues to embody the good things about being a wine maker. 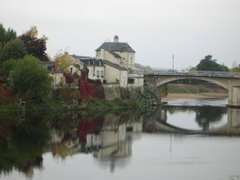 The Baudry wines are in my opinion, the very finest in Chinon. They are transparent in the truest sense of the word - the fruit is exceptionally pure and clean, the sense of soil is prominent, and changes in character with each cuvée, reflecting the specific terroir. You can smell and taste the gravelly soil in Les Granges, the richness of the clay in Les Grezeaux. But the Baudry wines also offer beautiful concentration and richness - these are not light wines. The marriage of transparency and concentration is what makes these such special wines, for me. Baudry's wines feature a striking absence of anything that might impede the delivery of soil via fruit. Herbicides are never used, and all chemical treatments are widely avoided. Everything is done by hand, from yield-control debudding to harvest, and all wines ferment via naturally occurring yeasts. As much as I adore the Baudry red wines, the rose has a special place in my heart too. The 2008 Bernard Baudry Chinon Rosé, $18, Louis/Dressner Selections, is 100% Cabernet Franc from two different parcels, one with flinty clay soils, and the other sandy gravel. The grapes are macerated in the press for a short time, technically making this a Rose de Pressurage (Pressed Rosé or Pressed-out Rosé). The wine then ferments in vat for as long as it takes to fully digest the sugars, a few weeks, sometimes months. "The vinification is quite similar to that of a white wine, as we want the wine to be dry (less than 3 grams of sugar/liter). That way, we can bottle the wine with just a very light filtration and very small doses of sulfites," Matthieu Baudry wrote in an email. This wine was bottled in mid-April 2009, and is more widely available this year then I remember in years past. Which is a good thing. This is a very special rosé with an entirely different aroma and flavor profile from what you're used to if you drink Provence and similarly styled rosés. Drinking it blind I defy you to guess it a rosé - it smells kind of rosé, but drinks like a white wine. The nose offers vibrant and pure strawberry fruit and summer melon, spicy white peppercorns, and with a little bit of air, roses. It is a gorgeous nose, robust and delicate at the same time. The wine is superbly balanced on the palate with fresh orchard fruit, a primary white grapiness, perky but gentle acidity, and a fragrant finish that really lingers. This is a rosé of great presence and distinction. It compliments anything that you would normally eat with a crisp white wine, and also typical rosé summer BBQ and picnic foods. I haven't tried this pairing yet, but something tells me that this wine will be beautiful with fresh goat cheese. Thanks again Cory for including me in your celebration of natural wine. "Hold on - Do I Like Châteauneuf du Pape?" That was the question I asked during a great night with friends, dinner, and lots of wine. I served three courses, each paired with a wine poured blind. I knew the wines - I selected them to pair well with the food I was serving. But my friends didn't. This is lots of fun, especially if it's not competitive, if it's about throwing out preconceived notions based on labels and prices and reputations. If it's about stimulating thoughtful discussion about wine. And it does, every time I do it. My friend Asher drinks a lot of Rhône wine. I'm discovering a taste for the Syrahs of the northern Rhône, but I haven't had a Châteauneuf du Pape that I really like, never mind a Gigondas, or Vacqueyras. I'm just not a big Grenache fan I think. But I've had maybe 10 of these wines though, so there's not a lot to go on. Anyway, my generous friend Tista gave me the gift of a bottle of 2003 Château Rayas last time I saw him, and I figured that it would be nice with our cheese course. And how much fun would it be to serve this iconic wine blind to a Rhône nut? Lot's I guessed. The wine was incredible, it lived up to the hype. The nose really bounced out of the glass with spicy raspberries, incredibly fresh and pure. There is some mint, some soil, and a great herbal undertone. A tremendously pungent nose that got more and more arresting over the half hour I savored it. The palate showed a teeny-weeny bit of alcohol heat, but was otherwise completely delicious, with silky smooth tannins, great purity, vibrant acidity, and an intense finish that really lingered. And this is a 2003, mind you - an outlier vintage of ridiculous heat that challenged many a vigneron's ability to create balanced wines. People mostly thought this was a Burgundy, that's how delicate and translucent it was, and how fresh and spicy. When I unveiled the wine there were gasps of "No way, Rayas!" Asher declared it to be the Châteauneuf du Pape of the vintage, something I cannot comment on because I've had only one other from 2003. But everyone agreed - impressive wine, to say the least. And you know what - at about $135, it darn well should be. Then it was Asher's turn. He opened a bottle that he brought, a bottle that was great fun, but that virtually ensured a hangover for all the next day. He served it to us, blind like the other wines. I could tell without even tasting that it was a Burgundy, a big and ripe example, with a heady fruity perfume. Perhaps it was also 2003? Tasting it made me reject 03 - too well balanced and controlled. Spicy orange notes on the palate to go with ripe dark fruit and finely grained dusty tannins that offered ample structure, very well balanced, and a lovely dark fruit and soil perfume on the finish. Some resiny pine notes with air. The wine felt mature, but the fruit was so fresh and youthful. I guessed it to be either a 2002, or perhaps a 2000 from a top producer and a top site. Since the wine had a masculine feel to it, and because it had that orange-spice note, I guessed that it was from Gevrey-Chambertin. I actually felt pretty confident about my guess, and I was thinking of how to politely accept the congratulations from my friends as Asher unveiled the wine. It was another Châteauneuf du Pape, the 1999 Vieux Télégraphe la Crau. Hmmm. No congratulations for this Brooklynguy, as it turned out. Beautiful wine, though, really compelling. And hold on - Do I Like Châteauneuf du Pape? Lars Carlberg recently left another informative and interesting comment on this blog, this time to the post on Domaine Tempier's 1994 Bandol. Lars, Mosel wine exporter, wine lover, and wine thinker extraordinaire, lamented the fact that alcohol levels are consistently higher now in so many wines from Bandol and Châteauneuf du Pape. Alcohol levels are typically at least 14% now in wines from those places, regularly hitting 15%. Until a decade ago, alcohol levels were typically about 13%. That increase of 1-2% represents 10-15% more alcohol in the wine, a significant increase. Why has this happened? I do not have a definitive answer for you, but Lars talked about phenolic ripeness and I want to explain what I think he meant - it's an interesting and counter intuitive idea. First of all, the amount of sugar (measured in Brix) contained within grapes determines the potential alcohol level of the resulting wine. Bandol reds and also those from Châteauneuf du Pape, like most red wines, are fermented until dry. If alcohol levels are higher now, then it seems clear that grapes are now picked at sugar levels that are higher than they used to be. Why would there now be more sugar in Bandol and Châteauneuf du Pape grapes? Perhaps it was a collective decision to pick later, encouraging maximum ripeness. But I don't think that's the answer. There are wine regions in which the prevailing style is to leave the grapes hanging as long as is safe to do so, producing ultra-ripe grapes that in turn produce huge, fruity, high alcohol wines. I don't think that's what they're going for in Bandol or in Châteauneuf du Pape. Phenolic ripeness (also referred to as physiological ripeness) refers to the changes in the tannins that occur in grape skins, seeds and stems. Sugar ripeness refers to the breakdown of acids and accumulation of sugars. The tannins in grape skins, stems, and seeds have to be ripe in order for wine to taste and feel right in your mouth. Under-ripe tannins can taste green and astringent, unpleasant. But sugar ripeness happens earlier than phenolic ripeness. So grapes that hang for a long time and achieve ultra-ripe sugars also achieve very good phenolic ripeness. Think of that California fruit bomb that exhibits loads of fruit and almost no structure. It's warmer than it used to be, so shouldn't ripeness occur earlier? Sugar ripeness - yes. Phenolic ripeness, not necessarily. What if grapes achieve sugar ripeness before phenolic ripeness is achieved? The grower must then either pick early, perhaps making wine with astringent tannins and a green streak, or must allow the grapes to hang longer, achieving higher sugars and wines of potentially higher alcohol. This is what I imagine is happening in Bandol and in Châteauneuf du Pape, and in other hot weather wine regions too. Global warming, as GW Bush said, is a load of hogwash spread around by environmentalist pagans. That wisdom notwithstanding, harvests that used to happen in late September and into October are now complete by mid September. In Bandol they're getting the right sugars, but they cannot pick grapes with unripe tannins. The wines are already notoriously tannic - imagine a big Bandol with unripe tannins. So they have to leave the grapes for longer than they'd like, and the wines are higher in alcohol. Perhaps they will start making off-dry wines in Bandol and Châteauneuf du Pape, in order to bring the alcohol levels back down. Or perhaps they will plant different grapes that require more sun in order to ripen. Or perhaps, truly fine red wines made from Mourvèdre, Grenache, Cinsault, Syrah, and the other southern grapes, will in 30 years be coming from the more northerly climes of Beaujolais and Burgundy. Or perhaps producers in Bandol and Châteauneuf du Pape will be forced to start de-alcoholizing their wines, and using all sorts of other unnatural processes in order to make balanced wine. None of this seems good. I'm buying hillside land with good exposure in Scotland and Greenland. Anyone want in? 2007 Pierre Gonon Vin de Pays de l'Ardèche Les Iles Feray, $17, Imported by Fruit of the Vines, Inc. Jean and Pierre Gonon are among the remaining handful of truly old-school producers in the northern Rhône Valley. Gonon's red wines bear little resemblance to those massive Syrah's that ooze with concentrated gobs of fruit. It's not that the wines are light - they are not. They are concentrated and intense, but they are also balanced and fresh, and I have yet to drink one that feels heavy. Gonon's St. Joseph is really is a wonderful wine, showcasing the nobility of the Syrah grape and the St. Joseph terroir in their meaty and mineral glory. The whites can be utterly incredible too, by the way, but this is a red wine post. Although Gonon's St. Joseph is quite reasonable in price at about $30, for me it is too expensive to be an everyday wine. Gonon's Vin de Pays, or country wine retails for about $17, which becomes about $15 with a mixed case discount - that's a pretty mellow everyday wine price, and especially if the wine is distinctive. And it is truly excellent wine. This is a Syrah from the hills of Ardèche right near St. Joseph, but it also includes grapes from young vines within St. Joseph. I had low expectations for this wine. The first bottle I opened was tremendously corked, and a friend whose palate I trust drank the wine and gave it a poor review. And I will say this - upon opening this wine is pretty tough - off putting really, with resin and highway tar dominating the nose, totally unappealing. Bad enough to consider pouring down the sink. Perhaps another flawed bottle? We left it sitting there open for an hour while cooking and when we returned it became really lovely. It is about meat and blood, pepper and tar, and wild animals, much more so than it is about fruit. A savage nose, quite pungent, but also exceptionally pure and pretty in its wildness. With another hour open floral aromas emerges, some bergamot even. Vibrant acids keep the wine juicy and fresh. The finish is deeply mineral and here the dark blue fruit emerges. Such a disjointed start, but this is excellent wine, and a fantastic value in old world old-school Syrah. It paired perfectly with a blood-rich cut of beef, a skirt steak. But it was not so intense as to overpower our early summer salad of candy-striped beets, young carrots, and ricotta salata. It is not a casual sipping wine, food is a must, and preferably something meaty. I could see this wine turning into pork broth after 10 years in a cold cellar. While it's young, I suggest opening it at least an hour in advance of drinking. I was lucky enough to be invited to Keith Levenberg's BBQ again this year. Last year at this event I drank a few great wines that were completely new to me. Again this year a clutch of lovely people assembled on the roof of a building in Chelsea, again we had great weather, again Keith grilled a bevy of truly excellent steaks, and again everyone brought some sort of interesting wine that they wanted to share with the world. 1995 Mount Eden Chardonnay Santa Cruz Mountains - if California wine tasted like this, I would drink lots of California wine. And by the way, put this up against a lot of white Burgundy from the same year and this will come out ahead, as there is not even a hint of oxidation. This wine was so fresh and well balanced, so utterly and completely delicious. Pure and intense fruit, secondary mint and soil, a mature richness that really lingers. Top notch wine. 1999 Trimbach Gewurtztraminer Cuvée des Seigneurs de Ribeaupierre - an Alsace Gewurtztraminer with some bottle age...yum. Actually, the nose was the star here, not to knock the palate which was lovely, but the nose was so complex with typical Gewurtz tropical fruit, but with such an elegant and mature tone. Really intriguing wine. 1981 Bodegas Riojana Gran Riserva - I don't know which Gran Riserva this was, as there are several, but whatever it was, it was fantastic. Such a clearly defined nose of bloody meat and metal, dried cherries, and rocks. So gentle for such a powerful wine. Antique in character, youthful in its power, this was just great wine. Why did they stop making wine like this in Rioja??? 1996 Michel Lafarge Beaune 1er Cru Grèves - I had so much fun drinking this wine. I wasn't collecting wine when this was released, and it's a real treat to get to drink a wine like this. Seemed austere at first, but actually it wasn't - it's just old-school Lafarge. The fruit was incredibly pure and the wine was perfectly balanced, and so the acidity of the vintage was the most obvious characteristic of the wine. But it had a quiet intensity, and was absolutely lovely. I want a bottle for myself, and perhaps a Burgundian cheese plate. 2007 Jean Foillard Morgon Côte du Py - really a pretty wine with lively and enticing fruit, and it puts on weight with air time. Elegant in body, crystal clean and pure, perfectly balanced - delicious wine. Not as meaty as the 2006, but more elegant. Great Beaujolais. I was eagerly anticipating drinking the 2000 Bruno Clair Savigny Lès Beaune 1er Cru Dominode, but it was corked. People hanging out with me should know this - I am a magnet for corked wine right now. Clearly I am unclean, and if/when I get better I will let you know. It's not easy to decide what wine to bring to this sort of event. It's a bunch of wine geeks - I wanted to bring something of the highest quality, but also something unusual. So I decided to bring a bottle of Equipo Navazos Sherry La Bota de Fino "Macharnudo Alto" Nº 15. Most were unfamiliar with this wine, and many of them were not terribly interested in Sherry. I can understand that - Sherry is still unusual for most people, and alot of it just isn't terribly special. But this is Equipo Navazos Sherry we're talking about, and it is as special as Sherry gets. "The Real Jay Miller," a bit of a legend in NYC wine circles, was well versed in Equipo Navazos wines. In fact, he told me, Jesus Barquin of Equipo Navazos is a friend of his, and would be coming to the BBQ later on in the evening. How's that for a coincidence? Jesus came, he saw, and he most assuredly conquered, bringing with him a bottle of Equipo Navazos Jerez-Xérès-Sherry La Bota de Manzanilla "Las Cañas" Nº 16. Tasting these two amazing wines side by side, listening to Jesus Barquin discuss them, I think I finally understood the difference between Manzanilla and Fino. People tend to speak of these wines as if they are exactly the same, only that Manzanilla comes from nearby Sanlúcar de Barrameda. Perhaps that is true when the wines are not individually distinctive. But these wines from Equipos Navazos were cousins at best. The Fino, a wine that I think of as light and elegant (and that is light and elegant), seemed positively brawny next to the Manzanilla's ethereal texture. Both smelled of the sea, but the Manzanilla was imposibly light, with only wispy hints of almonds on the nose and a ballerina's touch in the mouth. The Fino was more assertive and more definitively structured, and a bit more pungent. I loved them both. On Saturday afternoon during what must have been the 19th overcast and rainy day in a row in Brooklyn, good friends invited us to go to an opening at an art gallery and then to dinner in my old neighborhood, Prospect Heights. Since there was no chance of getting a babysitter on short notice, only one of us could go out. It's important to be spontaneous and to accept these kind of invitations, even if one of us has to stay home with the kids. We decided that BrooklynLady would go. So I was home on a Saturday night, our two sleeping kids in the other room. Earlier that morning at the farmer's market I bought two richly purple pieces of tuna, a fish I almost never buy. Tuna is ubiquitous in restaurants - tuna tartare, tuna steaks, tuna burgers, tuna this, and tuna that. It seems so overdone. But the tune looked beautiful and I had already seen some baby bok choy making its debut appearance of the summer, so I allowed dinner to select itself for me. And now, what wine to drink with a simply prepared rare tuna steak and baby bok choy tossed in the wok with slivers of green garlic? It's strange how picking wine for myself is so different from picking wine when you dine with others. Should I open something special and savor it greedily, not having to share it with anyone? I looked through our little cellar, considered a fancy Chablis, flirted with a great bottle of Champagne, and toyed with the idea of an Equipo Navazos Sherry. But a great bottle of wine by myself can be like the sound of one hand clapping. It is a delicious indulgence to open a great bottle of wine for yourself and yourself alone. But in the end, part of what makes a great bottle of wine so special is experiencing it with someone else, talking about it, seeing their pleasure in drinking it. So instead of opening something glorious, what I most certainly would have done if BrooklynLady and/or guests were with me, I opened a bottle of the more humble 2007 Clos Roche Blanche Touraine Sauvignon #2, $15, Louis/Dressner Selections. I've had great Clos Roche Blanche bottles, and so-so bottles, and this one was great, with a satisfying roundness, finely toned minerality, great texture, snappy acidity, and lovely herbal aromas and flavors. When this wine is good, it's less about Sauvignon Blanc and more about the hills outside of Tours. It was a kind and generous companion to my seared Tuna steaks with baby bok choy. And in the end, a nice dinner, a humble and lovely bottle of wine, and a few hours of alone time - something that can be very hard to come by with two small kids - that's one of many recipes for a great Saturday evening. 1994 Domaine Tempier Bandol Rouge, Kermit Lynch Imports, current vintage is 2006 and price is about $50. Sometimes you just have to open a special bottle of wine. We had one of those nights this week. BrooklynLady has been dealing with all kinds of stressful changes at work, the same for me, and our 5 month old has decided to wake up each night between 2 -3 AM, and start screaming. We're tired and we're stressed, and we need a vacation that we're not going to be able to take. And to top it off, the Yankees seem to turn into little league players every time they face the Boston Red Sox. So, we opened a phenomenal bottle of wine on a humid and rainy night, and wow, did we feel better. Actually, I've been looking for a reason to open this wine for a while now, and our collective mood along with a beautifully marinated set of beef kabobs turned out to be just the thing. I don't want to overdo it with the lavish praise, but this wine is a beautiful thing, and a great example of why aging wine is so rewarding. It was stunning on its own, a wonderful partner to our dinner, and totally and completely delicious. And it's only the Domaine's basic red, and from what is considered to be one of the more forgettable vintages in recent Provence history. Domaine Tempier is widely considered to be among the finest producers in Bandol, and therefore in all of Provence. The Peyraud family, the family that is credited with defining the modern Bandol AOC in the 1940's, continues to run the estate and make the wines. For more on this, check out Bert Celce's profile on the estate on Wine Terroirs - full of excellent photographs and information. Tempier, as with most of the top estates in Bandol, farms with the most minimal of chemical interventions, and uses natural yeasts to ferment the red wines - these are natural wines through and through. The Bandol Rouge is made of grapes from all of the Tempier parcels and reflects a blend of all of the terroirs. The blend is typically 75% Mourvèdre (appellation rules require that a Bandol rouge contain a minimum of 50% Mourvèdre), the rest Grenache and Cinsault. This wine was fantastic right upon opening, with a vivid perfume of tobacco and earth, fruit liquor, and something very animal, like horses. A beautifully mature and rewarding nose, the primary fruit long gone, and it got deeper and deeper over the course of the three hours it was open. The palate is sweet and ripe, and there is great balance. The acidity is still vibrant, and here there is the memory of sweet strawberries. The finish is an encapsulation of everything that happens in the wine, the soil, the echo of ripe fruit, the tobacco, the acidic snap. But the most impressive and memorable thing about this wine is that thing that is so prized in mature Bandol - the texture. It is absolute velvet, the tannins present and providing structure but so smooth and sweet. Truly memorable, what a wine! makes me feel so good about the other Bandol sleeping in the cellar. --BrooklynLady and I celebrated our anniversary last week, thrilled to be here and basically intact after the first five months of our second daughter. The President and his wife aren't the only ones who travel for date night. BrooklynLady and I went to Tokyo for dinner, or the closest thing to it in Manhattan, anyway. But before we went out, when she arrived home from work, BrooklynLady brought with her as a surprise an utterly beautiful bottle of Champagne, the Cédric Bouchard Inflourescence Brut Blanc de Noirs. Bouchard is the new superstar of the Aube who makes wine as if he were in the Côte de Nuits - all single vintage, single vineyard wines, with no dosage. The bottle BrooklynLady so wonderfully donated to our anniversary imbibement programme was all 2006, and it was more wine than Champagne, the bubbles merely incidental. Elegant and intense with drippy red fruit encased in a sheer layer of delicate chalk. Just gorgeous wine, worth seeking out and cellaring. --And speaking of our second daughter, whereas the first one barely eats, this one is already a foodie. She eats sweet potato and now mushed avocado with élan. She gets upset if I take even a moment between spoonfuls. I think I'm going to skip squash and move directly to duck confit. --Lyle Fass suggested that I try the Bernard Baudry 2008 Chinon Rosé in a comment on my recent rosé post. Not that I need a whole lot of prodding to drink Baudry's wines. We drank this wine the other night and it was outstanding, the spicy and floral essence of Cabernet Franc, and with super prickly acidity. A bowl of fresh berries on a worn wooden table sitting outside of a barn. An entirely different animal from the Provence rosés I've been drinking, but delicious nonetheless. --I love finding a great blog that becomes part of my daily scan. This one might may not be new to you, but as of about a month ago it was to me. Alfonso Cevola is smart, experienced, soulful, and very down-to-earth, and his blog is really great. Just check out this post in which he discusses the utter frivolity of obsessing over organic peaches, when forcing them into a "perverse ménage à trois with blood oranges and jalapeño chutney." --I've heard about how wine prices should be coming down amidst the global recession. But I have to tell you, I have't really seen it. Yes, there have been "moving of inventory" sales, but I still see the wines at $18 that cost $14 or $15 just a few years ago. And $27 is the new $22. Perhaps the downward pricing will hit more expensive wine, like 2004 and 2006 Burgundy that's still on shelves, or 2007 Bordeaux? Am I missing something, or have prices on wines in the $15-$30 range not really budged? We had quite a streak, and I guess I shouldn't complain. For several months, BrooklynLady and I enjoyed opening our wine with dinner without running into a corked bottle. The generally accepted odds say that about 1 in 9 bottles of white wine will be corked, and about 1 in 10 bottles of red. So yes, we had been beating the odds for a while now. Funny, I used to think that I couldn't pick out a corked bottle. Now I know that I actually am quite sensitive to it. Sometimes I am underconfident about it though, and I have to let the wine sit for 15 minutes and try it again to make sure. Anyway, our good luck ran out three weeks ago and we are mired in an extraordinary slump.It's getting to the point where I'm afraid to open wine - everything is corked. So no special wine lately, nothing from the cellar, only wine that is still on retail shelves so I can return it if (when) it is corked. You can't return a corked wine that you purchased more than a year or so ago, can you? It started with Pierre Gonon's Vin de Pays de l'Ardèche Les Iles Feray in late May, and this was the first bottle in so long that I argued with myself for a while before accepting the truth. And the flood gates opened and a week later we had corked Shinn Rosé, and five days later it was corked Qupé Roussanne. Tonight, merely two days after the corked Qupé, some friends invited us for a quintessential summer dinner of burgers off the grill. This guy likes Bordeaux, so I brought a wine I thought he would enjoy, a blend of Cabernet Sauvignon and Syrah from Provence, a naturally made wine with beautiful aromatics and a real sense of place, the 2000 Domaine du Deffends Côteaux Varois Clos de la Truffière. I had it bagged so everyone could taste it blind and enjoy it without preconceptions - it should have been great with burgers and vinegary salad. But it was ferociously corked. And I hadn't brought a second bottle. Lame, lame, lame. Is this my destiny for the nest two months? Loads of corked wine? And what are the rules, anyway, for wine that I've cellared if it's corked? Are there due process rules that I have to respect regarding the retailer? One day I'm going to open some fancy bottle of Burgundy that I've nurtured for 12 years in the cellar, something of which I could afford to buy only one single bottle...and it will be corked. And then, my friends, you will hear the sound of Brooklynguy yelling. 2006 Domaine Tissot Arbois Poulsard Vieille Vignes, $18, Imported by Frederick Wildman & Sons. Poulsard grapes are large in size - think of those rubber super-balls that you can buy from quarter machines in front of the supermarket. And because they have such thin skin, the juice to solid matter ratio is the opposite of what wine makers look for in, say, Burgundy. The resulting wines can be light in color, although they typically have the fruit character, texture, and tannic structure of red wine. The Jura, in eastern France right near Switzerland, is only place I know of where Poulsard is grown. Although the region is better known for its unique white wines, there are some great Jura reds too, and retail prices are still reasonable. Red wine grapes cultivated in the region include Pinot Noir, Trousseau, and Poulsard, and although I've had lovely examples of Jura Pinot and Trousseau, my favorite Jura reds are Poulsards. They combine the fruit forward spicy charm of a good cru Beaujolais with the complex woodsy perfume of red Burgundy, and the tannic structure of Nebbiolo. Okay, maybe not quite Nebbiolo, but the wines are tannic. My personal favorite thing about Poulsard is the certain something about the nose, something fruity and savory at the same time, something like a ripe blood orange. I am just beginning to scratch the surface of Poulsard. I've never had an aged example, and I have been assured that the wines can age beautifully - the tannins and the high acidity allow for that. And although I'm making my way through most of the wines available in NYC, there are plenty of quality Poulsards that don't make it here because they are not imported. Crazy as it might seem, the American wine market has not yet found its Poulsard voice. Anyway, I want to talk about Tissot's Poulsard because it is an excellent wine that in a hypothetical blind tasting of Poulsards would show in the same class as wines by Overnoy/Houillon, Puffeney, and the other big shots, but Tissot's wine is half the price of Overnoy/Houillon's, and much less than Puffeney's too. In other words, it's serious and delicious wine and it is inexpensive. 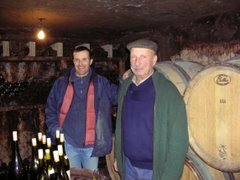 Bénédicte and Stéphane Tissot run an estate of about 35 hectares with vineyards in Arbois and the Côtes du Jura, and they recently acquired land in Château-Chalon. The entire estate is biodynamically farmed with Demeter certification. Yields are kept at rigorously low levels, grapes are harvested by hand in small baskets, indigenous yeasts do the work of fermentation, and very little sulfur is used. There are over 25 different wines produced, as the Tissots believe in expressing as best they can the diverse terroir of the Jura. The 2006 Poulsard Vieille Vignes is made without sulfur, and the wine smells and tastes incredible clean, and all of the smells and flavors have great clarity. This makes for an interesting contrast in this case, because the nose is full of underbrush and dried leaves, almost mushroomy. So this is a crystal clear dried leaf and underbrush wine we're talking about. There is lovely fruit also, bright red currant and dark plum fruit, and there is a touch of brown sugar. The wine is deeply colored and the fruit is ripe and rich, with that blood orange nuance that I love in these wines. The tannins are smooth but quite prominent right now, and there is a definite sense of gravelly rock on the finish. Not as delicate as Houillon, not as focused as Puffeney, but this is a beautiful and complete wine. It is open and joyous and it is elegant too. And it is an incredible value at about $18.